SPRING VALLEY, MN -- There's a piece of farmland in southeastern Minnesota that looks like the territory of a giant gopher. Piles of dirt, a house story high, dot the landscape beside suspicious-looking holes and depressions. But this is not a field of rodent residue. It's the underground playground of caver John Ackerman. "Why would I want to risk my life to find a bunch of caves? Come with me and walk through 19 caves and you'll have your answer," said Ackerman, the man who has discovered 19 caves under his 500 acres near Spring Valley. He's pretty sure he's on his way to being the first person in cave number 20. "Some people have called me an adrenaline junkie, yes, there may be some truth to that. Let's face it. You can't find 19 caves without some degree of risk." Ackerman says sinkholes on the surface of the land show there are caverns beneath. Geologists say there are some 30,000 sinkholes in Fillmore County, but often there is no opening big enough for someone to climb through. So Ackerman makes one, first by excavating the garbage people have been throwing into his sinkholes since the mid-1800s (click here to see the pictures of what he found in the latest sinkhole, 'Artifact Sink'). Then he digs out soil from the last glaciers, and then, if he's lucky, a limestone cavern appears. As it travels horizontally beneath the surface, the passage often narrows to a tight spot. He uses explosives to help him slide past the tight squeeze carved by water millions of years ago. He does it carefully, first drilling holes in the rock, inserting explosives, and then running a long electrical wire away, well out of danger. "When you are using explosives you never get a second chance," he said. One explosion later, Ackerman goes in to clear out the rubble in the small tunnel. "We'll go in and peel the rest of the rock off the walls and hopefully find a big cave." He says it's important people understand he's not blowing up farmland. He is underground, and only getting there through the sinkholes farmers have been unable to work near anyway. In fact, he's leaving the places better than when he found them. "People that don't understand what we do, might have that feeling in their mind that something terribly wrong will happen to our groundwater by me doing this. But you know, when you travel around my property and you take a look at my 19 cave entrances, you won't find anything other than natural prairie grasses or trees growing alongside the new culvert entrances. The ground is in better condition than before I excavated it." He's on a never-ending quest for new caves and caverns. Every trip underground holds the promise of new wonders. "I have good feeling about this [one]. 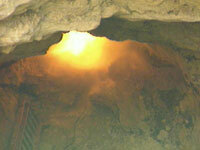 There is actually wind flow in there which indicates going to a cave." Before Ackerman bought this farmland, only one cave was there: Spring Valley Caverns, the entrance marked by a World War II-era building. The tourist attraction was open for only a few years in the middle-part of the last century before going out of business, leaving no access to the cave, until Ackerman bought the land in 1989. The Quonset hut is now gone, replaced by Ackerman's brand new building, nestled unobtrusively into a hillside more than a mile from the nearest gravel road. Outside, stonemasons carefully had built the entrance from natural limestone. Only a handful of private groups have explored his Spring Valley Caverns and Cave Preserve. He generously allows a few geologists and spelunkers, cave fans who are trained in mapping Minnesota, to visit his caves. It's getting harder and harder to find liability insurance, and more expensive, so he asks visiting groups to help defray the insurance costs. Ackerman belongs to the Minnesota Speleological Society (MSS), which is the best way for you to get underground to see the caves. Inside, the building reveals itself as a massive, three-level structure, home base for the lucky few people Ackerman allows to visit. Because his hideaway is perched over three cave entrances, Ackerman had to find a bridge contractor to slightly modify his design, and then construct the building using thick concrete and iron reinforcing bars. Even on the bitterly cold January day we were there, the temperature inside was around 50 degrees, without any artificial heat source. The caves contribute the warm air, and the underground water contributes humidity at nearly 100 percent, condensing water on walls, windows, doorways, and our camera lens, which was difficult to keep fog free. Ackerman says its worth it to work for a year or two in a small tunnel, when it opens up into a large underground cavern system, where you can walk for literally miles, through limestone voids carved by underground rivers millions of years ago. It's not surprising that these caverns are only now being discovered. It takes great courage and a lot of skill to survive these treacherous underground labyrinths. He led us through a narrow crevice, with rocks jammed in below our feet, forming a craggy floor for some of the way. Then it opened up into a gap, straight down. Ackerman 'chimney climbed' over it, bracing himself on either side of the crevice. "You don't want to slip here. You'd fall to your death." Ackerman has climbed down the hole before, all the way down to an underground river. He tossed a rock down the hole. We could hear it fall for six seconds, like something from the mines in the "Lord of the Rings" movies. Two miles into the Earth is no place for claustrophobics, or for people who suffer panic attacks. Caving is dangerous, dirty work. 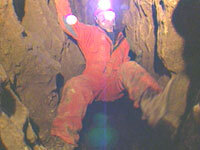 Cavers must have rock climbing skills, scuba diving skills, and nerves of steel to be successful. Some passages can only be reached by swimming under a river's surface. Spelunkers always travel in pairs, at least, and always tell someone where to find them, if they haven't returned at the agreed upon time. Ackerman says fear is part of the challenge, but fear should never be ignored. "That can be a dangerous thing, because you're more susceptible to uh, to die. I mean, lets face it, [fear] is Nature's way of telling you you're not supposed to be down here." For John Ackerman it's worth risking rock falls, asphyxiation, broken bones and getting lost. The chance of suddenly bursting through to a new wonderland is enough. "I do it just for the sheer fascination of finding unexplored caverns." Other things are streaming down into these underground wonderlands. For more than a 150 years local farmers used the sinkholes as garbage dumps. "Anything that happens above ground on the surface has a trickle down effect. Directly through the caves and down into our drinking water," Ackerman said. Several years ago he showed us miles of polluted underground rivers full of what we have thrown away. "We are three to four miles into the earth exploring unknown territory, and we are looking into voids and seeing Barbie dolls dangling from the ceiling, along with used motor oil filters and truck tires. We could smell it, we could see it. Cave passages in the Spring become completely clogged with foam from fertilizers." The trash was not buried in the caves--it has been carried along these subterranean tunnels by the seasonal rush of water, and no one knows how far down it all goes.